Ön egy Atradius weboldalra lépett be. Azzal, hogy a weboldalon található valamely funkcióra kattint - az oldal megnyitásakor létrejövő, első cookie-t is beleértve - elfogadja a cookie-k használatából eredő információk tárolására vonatkozó gyakorlatunkat. A sütik használatáról és letiltásáról további információkat talál a Cookie információk oldalon. 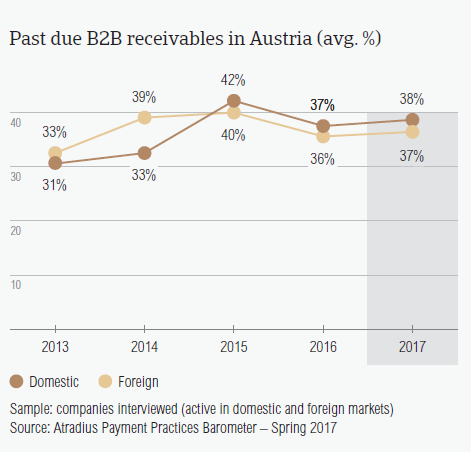 There has been a modest increase in the percentage of overdue B2B invoices of Austrian respondents in 2017 (37.4%), compared to one year ago (36.3%). 2017 is a year in which political uncertainty is a potential headwind for eurozone businesses. While Austria’s insolvency outlook is stable, the unpredictable outcome of elections held in the countries of some of its main trading partners may impact business activity due to close trade and investment ties. Among the Western European countries surveyed, Austria is one of the least inclined to sell on credit terms. The country’s conservative approach was also observed in previous years and may not be directly linked to the significant amount of uncertainty in 2017. Like in 2016, the proportion of B2B sales on credit in Austria (26.5%) is far below that of Western Europe overall (38.8%). 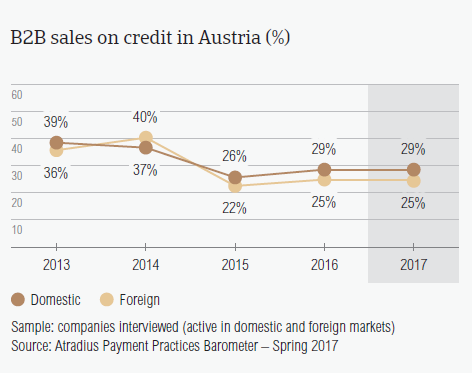 Austrian respondents’ aversion of selling on credit is slightly more focused on foreign (24.5%) than on domestic transactions (28.6%). The greater reluctance to offer credit terms to foreign than to domestic B2B customers is shared with the other Western European countries surveyed (domestic: 42.6%; foreign: 35.1%). The higher percentage of sales on credit to domestic customers may reflect more familiarity with domestic business practices and a higher level of trust when dealing with compatriots. Respondents in Austria (91.4%) reported late payments from their B2B customers more frequently than their peers in Western Europe (87.8%). 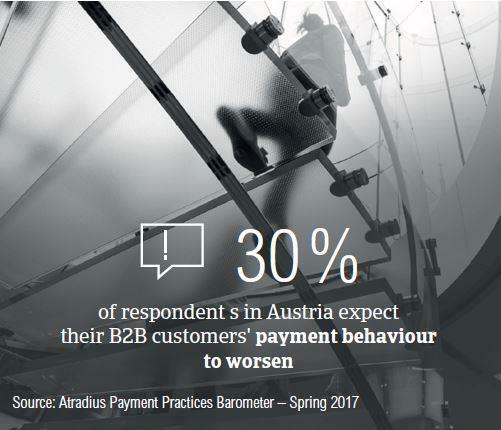 The percentage of Austrian respondents who have experienced late payments from their B2B customers increased compared to last year (90.6%). This resulted in an average of 37.4% of the total value of B2B receivables remaining unpaid by the due date. Austria’s percentage of overdue invoices is below the 41% regional average and one percentage point higher than one year ago (36.4%). Late payment of domestic and foreign invoices is reflected in the Days Sales Outstanding (DSO) figure reported by Austrian respondents. In 2017, this averaged 34 days (two days shorter compared to 2016), and is markedly below the 44 days average for Western Europe. The lower average DSO level may point to Austrian respondents’ higher efficiency in collecting high value invoices. 58.8% of respondents in Austria (62.9% in Western Europe) expect no change in their DSO over the next 12 months while a sizeable 25% expect an increase (19.1% in Western Europe). 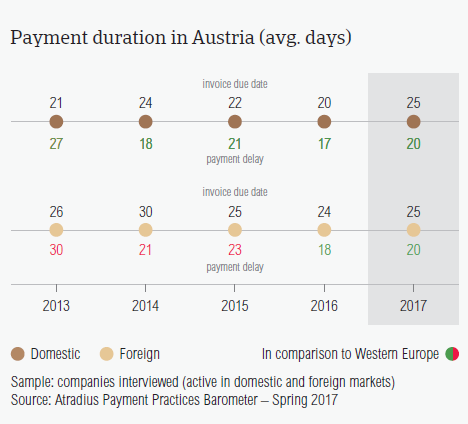 Despite the somewhat longer payment terms extended by respondents in Austria in 2017, they remain some of the shortest in the region. Payment delays from B2B domestic and foreign customers increased slightly compared to 2016. In 2017, payment terms granted by respondents in Austria averaged 25 days, three days longer compared to the average of 2016. This is below the regional average of 32 days. Next to Great Britain (23 days) and Germany, the Netherlands and Denmark (each with 24 days), Austria offered the shortest payment terms in the region. This underlines the lower level of comfort with extending credit than in other Western European countries. In 2017, domestic B2B customers were given longer payment terms to settle their invoices (25 days). These payment terms now match the average foreign payment terms suggesting that there is little difference in the perception of risk when selling to domestic or foreign buyers. Consistently with what was observed at regional level, there was a modest increase in payment delays from domestic B2B customers (up three days compared to 2016). Foreign B2B customers paid, on average, two days slower than one year ago. Respondents in Austria need to wait 45 days (almost one week longer than in 2016) to convert B2B credit sales into cash. Insufficient availability of funds was the most frequently mentioned reason for payment delays in Austria and in Western Europe overall. The percentage registered in Austria is significantly higher (51.7%) than that of Western Europe (43.5%). 56.1% of suppliers in Austria (52.6% in Western Europe) said that their domestic customers delayed payment most often due to liquidity issues. Buyers using outstanding invoices as a form of financing (31.7%) and disputes over the quality of goods or services provided (23.1%) were the two next most frequent reasons for payment delays. 47.3% of suppliers in Austria (34.5% at regional level), said the key payment delay factor affecting credit based transactions with overseas customers was insufficient availability of funds. This was followed by buyers’ use of outstanding invoices as a form of financing and the complexity of the payment procedure (26.7% each). Payment delays by domestic and foreign B2B customers appear to have caused 21.6% of respondents in Austria to lose revenue. This is significantly higher than the regional average of 15.3%. 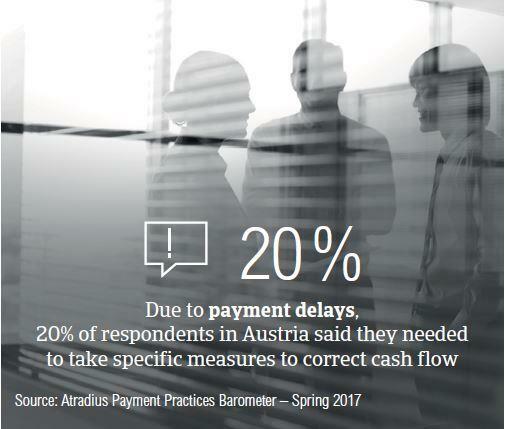 As a result of late payment, 20% of respondents in Austria said they needed to take specific measures to correct cash flow. Once more, respondents in Austria seem to be more affected by this than respondents in the other Western European countries surveyed (18%). 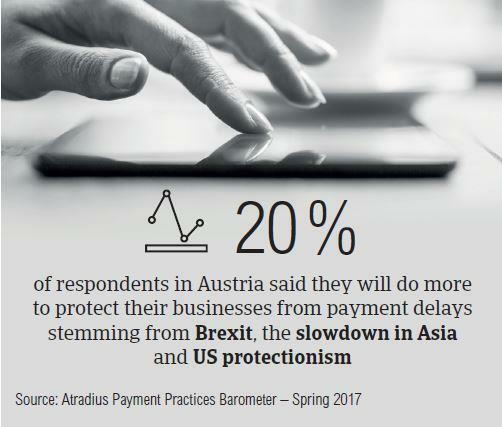 Respondents in Austria plan on doing more to protect their businesses from payment delays resulting from the impact of Brexit, the slowdown in Asia and US protectionism than their peers in Western Europe. Fewer respondents in Austria (46.3%) than in Western Europe (48.3%) said that they will not change their current mix of credit management tools to protect their businesses against the risks of payment defaults stemming from these developments. On the other hand, 19.8% said that they will increase their usage of credit management tools. The most preferred actions are checking buyers’ creditworthiness (24.9%) and monitoring buyers’ credit risk (22.2%). The credit management actions chosen by the most Austrian respondents in respect to the impact of Brexit are increasing bad debt reserves (19.4%) and checking buyers’ creditworthiness (23.4%). A significantly higher percentage of respondents in Austria (26.2%) than in Western Europe (20.9%) said that they will check their buyers’ creditworthiness more often to protect against the effects of the slowdown in Asia. A similar approach is planned in respect to US protectionism. 25.1% of respondents in Austria said that they will increase checks on their buyers’ creditworthiness. 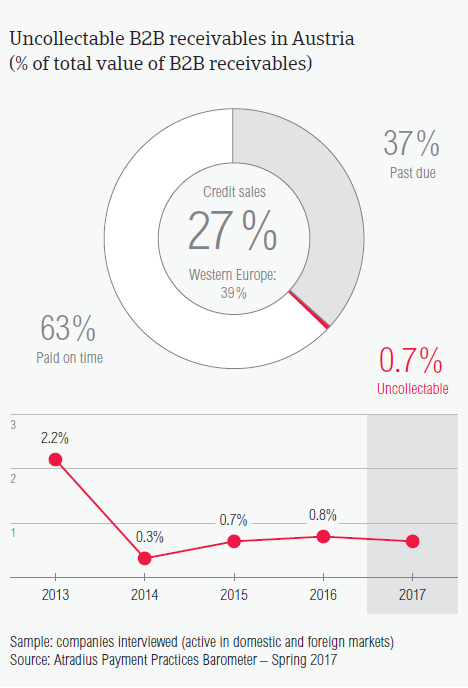 The proportion of B2B receivables reported by suppliers in Austria as being written off as uncollectable (0.3% of the total value of B2B receivables) is below the average for Western Europe overall (0.6%). Domestic receivables were written off as uncollectable twice as often as foreign receivables (domestic 0.5%, foreign 0.2%). However, in both cases the percentage of uncollectable receivables was below the regional averages (domestic 1%, foreign 0.3%). Uncollectable B2B receivables originated most often from the construction, consumer durables, services and business services sectors. B2B receivables were reported to be uncollectable mainly because the customer went bankrupt (66.9%) and because of the high cost of pursuing the debtors (27.2%). 23% of Austrian respondents reported write-offs because the buyer could not be located. 30% of respondents in Austria expect a deterioration in the payment behaviour of their B2B customers over the next 12 months. Invoice payment terms given to B2B customers in the construction materials and textiles sectors are notably more relaxed than in other industries (each averaging 35 days). This means B2B customers in these sectors had 10 days extra to pay their invoices compared to the average payment terms at country level. At the other end of the scale, B2B customers in the paper industry were granted the shortest payment terms (14 days). B2B customers in the agriculture and consumer durables sectors took the longest to pay their invoices (72 and 71 days respectively). The most frequently cited reasons for payment delays in these sectors were liquidity issues (agriculture: 63%, consumer durables: 59%), the buyers’ use of outstanding invoices for financial advantage (agriculture: 38%; consumer durables: 25%) and the formal insolvency of the buyer (agriculture: 13%, consumer durables: 41%). More respondents in Austria (64%) than in Western Europe (58%) don’t expect changes in the payment behaviour of their B2B customers over the next 12 months. Of those expecting a change, more anticipate deterioration (28%) than improvement (8%). In 2015, Austrian business insolvencies decreased by 5%. However, in 2016 the pace of corporate insolvency decrease is expected to slow down to just 2%. Due to late payment, nearly twice as many respondents in Austria (21%) than in Western Europe delayed investment, in property, plant and equipment. Az itt tett nyilatkozatok csak tájékoztató jellegűek, ezekre nem lehet hivatkozni semmilyen esetben sem. Az irányadó feltételeket megtalálja a jelenleg érvényes szabályzatban vagy a megfelelő termék vagy szolgáltatási megállapodásban. Az itt leírtak nem értelmezhetők úgy, hogy az Atradiusnak bármilyen joga, kötelezettsége vagy felelőssége lenne, beleértve a vásárlók átvilágítását vagy az Ön nevében végzendő egyéb átvilágításokat. Ha az Atradius átvilágítási eljárást végez valamely vevőnél, azt saját kockázatvállalási céljai miatt teszi, és nem a Biztosított vagy bármely más személy javára. Ezen kívül az Atradius és a hozzá kapcsolódó, kapcsolt vállalatok vagy leányvállalatai semmilyen körülmények között sem felelősek semmilyen közvetlen, közvetett, speciális, véletlen vagy következményként bekövetkező kárért, amely a nyilatkozatokban tett információk felhasználásából ered.